Regardless of whether it is optimized energy storage, high-temperature superconductors, bendable metals, or fabrics that can completely wick liquids, materials scientists investigate and perceive the physics behind atoms that interact in solids to eventually find ways to enhance materials used in all aspects of the everyday life. However, the limit to materials science research does not lie in alchemical trial and error; in order to gain better insights into existing materials and to enhance them, it is necessary for scientists to be able to analyze material properties at the atomic scale and under severe conditions. Consequently, scientists have been more and more dependent on simulations to inform or complement experiments into the behaviors and properties of materials. A research team headed by Dr Arkady Krasheninnikov, physicist at the Helmholtz-Zentrum Dresden-Rossendorf, collaborates with experimentalists to find answers to fundamental questions related to properties of materials, and recently, the researchers achieved a huge advancement—experimentalists could observe, in real time, the behavior of lithium atoms upon being placed between two graphene sheets. Researchers consider a graphene sheet to be a 2D material, since it’s thickness is just only one atom, which rendered it feasible to observe the motion of the lithium atoms in transmission electron microscopy (TEM) experiments. Thanks to the Gauss Centre of Supercomputing (GCS), Krasheninnikov’s team gained access to supercomputing resources and hence could use the High-Performance Computing Center Stuttgart’s (HLRS’) Hazel Hen supercomputer to simulate, validate, and build up on the experimental findings of the team. The collaborative study was reported recently in Nature. 2D materials exhibit useful and exciting properties, and can be used for many different applications, not only as a support in TEM. Essentially, 2D materials are at the cutting edge of materials research. There are likely about a couple thousands of these materials, and roughly 50 have actually been made. In order to gain better insights into 2D materials through experimental means, scientists often use TEM at present. The technique enables them to suspend small, thin pieces of a material, then irradiate it with a high-energy electron beam, eventually producing a magnified image of the material that can be analyzed by the researchers, quite similar to a movie projector that projects images taken from a reel onto a larger screen. Once experimentalists gain this view into a material, they can better chart and predict the positions and arrangements of the atoms. However, the high-energy beam allows more to be done than merely helping scientists observe materials—it also acts as a tool to analyze the electronic properties of 2D materials. Furthermore, the high-energy electrons from TEM can be used by the scientists to remove individual atoms from a material at a higher precision to observe the changes in the behavior of the material changes based on the structural change. 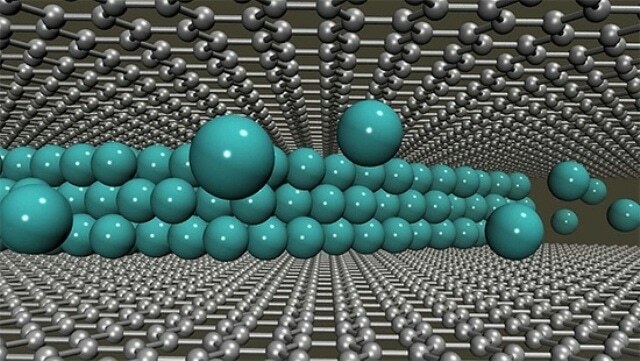 Recently, experimentalists at the Max Planck Institute for Solid State Research, Stuttgart and the University of Ulm intended to gain better insights into the way lithium particles interacted between two atom-thin graphene sheets. Better insights into lithium intercalation, or positioning lithium between layers of another material (here, graphene), enables researchers to develop new techniques for designing optimized battery technologies. Experimentalists obtained data from TEM and requested Krasheninnikov and his colleagues to rationalize the experiment with the help of simulation. Simulations enable scientists to view the atomic structure of a material from a range of different angles, and they can also help accelerate the trial-and-error strategy to designing new materials completely by means of experiment. Simulations cannot do the full job, but they can really limit the number of possible variants, and show the direction which way to go. Simulations save money for people working in fundamental research and industry, and as a result, computer modelling is getting more and more popular. In this study, Krasheninnikov and his colleagues discovered that the atomic coordinates, or the positions of particles in the material, observed by the experimentalists would not be stable, that is, the material would not obey the laws of quantum mechanics. Krasheninnikov and his colleagues used the simulation data to suggest a different atomic structure, and upon re-running its experiment, the team found an absolute match with the simulation. Sometimes you don’t really need high theory to understand the atomic structure based on experimental results, but other times it really is impossible to understand the structure without accurate computational approaches that go hand-in-hand with the experiment. For the first time, the experimentalists could observe, in real-time, the behavior of the lithium atoms upon being placed between two graphene sheets and, using the simulations, understand the arrangement of the atoms. Earlier, it was assumed that the lithium would be structured like a single atomic layer in such an arrangement; however, the simulation revealed that lithium had the ability to form bi- or trilayers, at least in bi-layer graphene, prompting scientists to search for innovative ways to enhance battery efficiency. Krasheninnikov stated that although simulation has achieved major breakthroughs in the last 10 years, there is still room for enhancement. The research team can effectively run first-principles simulations of 1000-atom systems over an extended period of time to view short-term, or nanosecond time scale, material interactions. Larger core counts on futuristic supercomputers will enable scientists to include an increasing number of atoms in their simulations, that is, they can model more meaningful and realistic slices of a material in question. Krasheninnikov noted that the greater difficulty is with regard to the time period for which the researchers can simulate material interactions. To be able to analyze phenomena that occur over longer periods of time (for example, the way in which stress can form and spread a crack in metal), researchers must be in a position to simulate minutes or even hours to observe how the material changes. Having said that, scientists must also need to take very small time steps in their simulations to model the ultra-fast atomic interactions in a precise way. Although merely making use of more compute cores enables researchers to perform faster calculations for larger systems, it cannot make every time step go faster in case a specific “parallelization” threshold is attained. In order to break this logjam, researchers will have to rework algorithms to achieve more efficient calculation of each time step across a large amount of cores. Krasheninnikov also suggested that designing codes based on quantum computing could allow simulations with the potential to observe material phenomena that occur over longer periods of time—quantum computers may be ideal for the simulation of quantum phenomena. Irrespective of the direction that researchers take, Krasheninnikov stated that access to supercomputing resources through GCS and PRACE allows him and his colleagues to maintain steady progress. “Our team cannot do good research without good computing resources,” he stated.